Evander Holyfield bested Mitt Romney in an AAMCO-sponsored boxing match, which raised $1 million for charity. 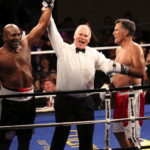 Former presidential hopeful Mitt Romney and five-time Heavyweight Champion of the World Evander Holyfield recently squared off in a boxing match in Salt Lake City, Utah, that raised $1 million for charity. AAMCO, the world’s largest transmission repair franchise and leader in total car care, sponsored the event in support of Charity Vision, a nonprofit organization focused on reversing the global epidemic of blindness. Charity Vision reports that nearly 39 million people around the world live in total blindness; 90 percent of those are in developing countries. “AAMCO and our transmission repair franchise owners were proud to be asked to support Charity Vision in their fight to find sustainable ways to cure the blindness problem in our communities at home and across the globe,” says Brett Ponton, AAMCO President and Chief Executive Officer. The inaugural Charity Vision Fight Night event ultimately found Holyfield besting the former Massachusetts governor in a two-round contest that wasn’t without surprises. The packed house at Rail Events Center in Salt Lake City witnessed Romney taking down Holyfield in the first round, before the legendary boxer chased Romney around the ring, landing gentle jabs. Romney ultimately forfeited the match to Holyfield in the second round. “I’ve been fighting for most of my life — starting as a kid. I’m the Real Deal. And now I’m fighting, alongside AAMCO, to wipe out blindness because a real fighter can’t turn down a challenge — especially one I know we can win,” Evander Holyfield said in a news release. One hundred percent of donations to Charity Vision go directly to fighting blindness, and the $1 million the celebrity boxing match raised will be used to fund training for doctors, medical equipment, vision screenings, and eye surgeries, according to CBS News. Charity Vision partners with doctors in developing countries to find solutions to worldwide blindness. For more than 50 years, AAMCO transmission repair franchise and its network of dealers have given back to the communities in which they operate, supporting worthy causes that impact customers’ lives. Most recently, to celebrate its golden anniversary, AAMCO partnered with the Military Order of the Purple Heart to honor and support wounded veterans and their families in all 50 states. 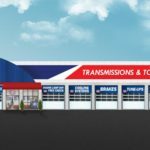 AAMCO is the world’s largest chain of transmission specialists and a leader in total car care services. 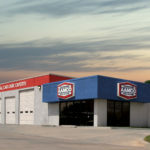 AAMCO has more than 675 automotive centers throughout the United States and Canada. Established in 1962, AAMCO centers are proud to have served more than 45 million drivers. For more information, visit www.aamcouniversity.com, www.AAMCO.com or www.AAMCOBlog.com.